Graphic Design is the business of making or choosing marks & arranging them on a surface to convey an idea. The primary role of Graphic Design is identification. To say what something is and where it came from. Identity A good business mark is often deceptively simple, decorative & functional. Identity should aim to accentuate the positive. • Your logo/symbol expresses your businessʼ personality. • Shares the benefits you want your customers to associate with your brand? • A well designed identity used correctly creates market awareness, emotional associations, builds loyalty & represents value to your consumer. Promotional Material educate potential customers or vendors about your enterprise, the services you offer and increase public awareness of your business. • Achieve their mission through dynamic self-promotion, clean, beautiful appropriate design. • From the humble business card to your brochure or catalog sells your product or service to your prospect later. • Develops the positive perception of your business. 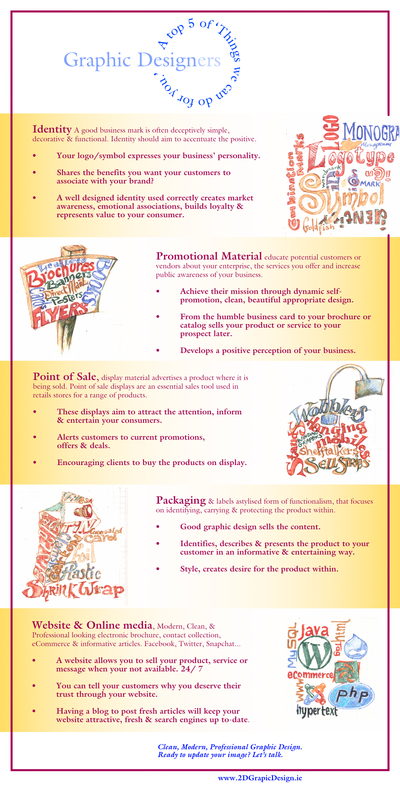 Point of Sale, display material advertises a product where it is being sold. Point of sale displays are an essential sales tool used in retails stores for a range of products. • These displays aim to attract the attention, inform & entertain your consumers. • Alerts customers to current promotions, offers & deals. • Encouraging clients to buy the products on display. Packaging & labels a stylised form of functionalism, that focuses on identifying, carrying & protecting the product within. • Good graphic design sells the content. • Identifies, describes & presents the product to your customer in an informative & entertaining way. • Style, creates desire for the product within. • You can tell your customers why you deserve their trust through your website. • Having a blog to post fresh articles will keep your website attractive, fresh & search engines up to-date. Clean, Modern, Professional Graphic Design. Ready to update your image?